(Nanowerk News) A new study has found both the cause and a solution for the pesky tendency of perovskite solar cells to degrade in sunlight, a research breakthrough potentially removing one roadblock to commercialization for this promising technology. In a key finding, researchers at Los Alamos National Laboratory have found those degraded devices exhibit self-healing powers when given a little time in the dark. The team determined that photo-degradation in perovskite cells is a purely electronic process due to charge accumulation without chemical damage to the crystal structure and therefore can be reduced, while the cells' self-healing properties allow them to rebound in the dark. "We can stabilize the device performance by controlling the environmental temperature," said Wanyi Nie, lead researcher on the paper published today in Nature Communications ("Light-activated photocurrent degradation and self-healing in perovskite solar cells"). "The degradation of the devices can be suppressed by simply lowering the temperature by few degrees, that is, from 25 degrees Celsius to 0 degrees Celsius." The team, lead by Aditya Mohite from the Los Alamos "Light to Energy" team in the Material Synthesis and Integrated Devices group, is exploring organometallic halide semiconducting perovskite solar cells. They are promising because of their high power conversion efficiency (PCE) exceeding 20 percent and the low fabrication costs -- the perovskite material is synthesized via a low-temperature solution process. While achieving high PCE is important, the successful transition from a proof-of-concept experiment to actual market-viable photovoltaic technology requires the device to operate with stability under continuous sunlight, of course, and in the air and humidity of outdoor conditions. The problem of stability against ambient air/humidity can be circumvented through encapsulation schemes, but the photo-stability of the perovskite-based devices remained an open question. As noted in the literature, these solar cells will undergo degradation with constant light soaking even when the device is under vacuum. 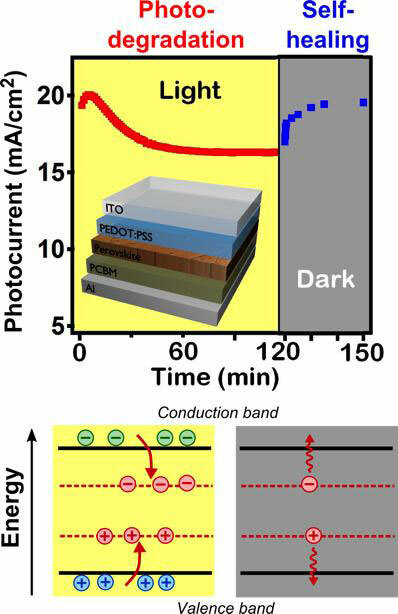 Such degradation over time with solar illumination could undermine the commercialization of perovskite-based solar cells. The new paper, "Light-activated photocurrent degradation and self-healing in perovskite solar cells" (DOI: 10.1038/ncomms11574), co-authored by Wanyi Nie and Jean-Christophe Blancon, describes the photo-degradation process. "What we found in this study is that under constant 1-sun illumination the large-grain perovskite solar cells degrade majorly in terms of the photocurrent," Nie said. "But what's interesting is that the devices can self-heal when sitting in the dark for a short while." By performing extensive device and spectroscopy characterization, the team found that sunlight triggers the activation of meta-stable trap states at relatively low energy deep in the perovskite bandgap, which results in the trapping and captures of photo-generated charge carriers. Over time, trapped carriers can further accumulate in the device, reducing the photocurrent. On the other hand, placing the solar cell devices in the dark for several minutes allows for "evacuation" of these trapped charges, thus leading to the recovery of the pristine device performances upon the next operation cycle. The team also found that these processes are strongly temperature dependent, and that temperature control over a range of a few tens of degrees can either circumvent the activation of the photo-degradation mechanisms or speed-up the self-healing process. After exploring several possible physical mechanisms to explain the microscopic origin of the formation of these trap states, joint experimental and theoretical investigations concluded that the most possible scenario is the creation of small polaronic states involving lattice strain and molecular re-orientations of the organic cation present in the perovskite lattice. "Although several theoretical works have predicted the important role of the organic cation (CH3NH3) in organometallic halide perovskite, it is one of the first joint experimental-theoretical reports on the observation of its impact on the properties of perovskite materials and devices," Blancon said. "Our understanding of the organic cation is still primitive, but our work demonstrates its utmost importance in the photo-stability of perovskite devices and calls for further investigations in the future." Most importantly this study will provide researchers across the world a first solution to the photo-stability issue in perovskite devices, and future research is now underway toward improvements and the long term technological viability of perovskite-based photovoltaics. Hybrid perovskite materials, crystalline semiconductors that can be processed from solution at low temperature, have excellent opto-electronic properties that have enabled a wide variety of device applications. Los Alamos has been one of the leaders in the hybrid perovskite photovoltaic research community. By solving the stability problem, the team is ready to apply the material in other applications related to US energy security.